Dental diseases are perhaps the most prevalent infection-related diseases in humans. Biofilm is involved in almost every infectious disease compromising oral health, notably caries, periodontal disease, gingivitis, endodontic infections and peri-implantitis. 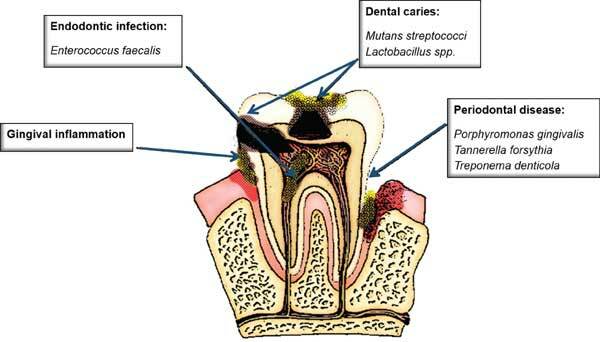 Current therapies of biofilm-derived oral infections lack sensitivity; they are not species-specific and kill pathogenic species as well as commensal species, which are protective against the formation of pathogenic biofilms. Moreover, antibiotics have a limited effect on biofilm and are almost unused in oral diseases. A promising alternative approach is bacteriophage (phage) therapy. Phages play a key role in the natural balance in a predator-prey relationship with bacteria and thus have the potential to be efficient anti-bacterial agents. Phages are highly efficient against biofilm, strain specific and easy to isolate and manipulate. Thus, like in many other medicinal fields, phage therapy offers new horizons to dentistry, both therapeutics and research. The present review presents the etiology of common oral diseases, characterization of the infection and the treatment challenges of phage therapy in dentistry. Recent findings and development in the use of phages for prevention, control, and treatment of oral infections as well as possibilities of engineering the oral microbiome are discussed. Keywords: Bacteriophage, Phage, Biofilm, Caries, Dentistry, Oral, Periodontal disease, Phage therapy, Antibiotic resistance, Multi drug resistant bacteria. Keywords:Bacteriophage, Phage, Biofilm, Caries, Dentistry, Oral, Periodontal disease, Phage therapy, Antibiotic resistance, Multi drug resistant bacteria. Abstract:Dental diseases are perhaps the most prevalent infection-related diseases in humans. Biofilm is involved in almost every infectious disease compromising oral health, notably caries, periodontal disease, gingivitis, endodontic infections and peri-implantitis. Current therapies of biofilm-derived oral infections lack sensitivity; they are not species-specific and kill pathogenic species as well as commensal species, which are protective against the formation of pathogenic biofilms. Moreover, antibiotics have a limited effect on biofilm and are almost unused in oral diseases.